No one in the truest sense. The name is my late grandfather’s middle names and as he was an important sports influence in my life I thought it an appropriate choice. Similarly the fish themed logo references my late grandmother’s maiden name which was Salmon. She was a London-trained seamstress who provided me with the first insights into the industry – she even oversaw my first capsule collection that was designed and produced for my grade six elementary school year. As a business MFT began in Toronto in 2010. I moved it home to Vancouver in 2012 with one focus: to educate, create and lay the foundation for a locally designed and individually tailored wardrobe. 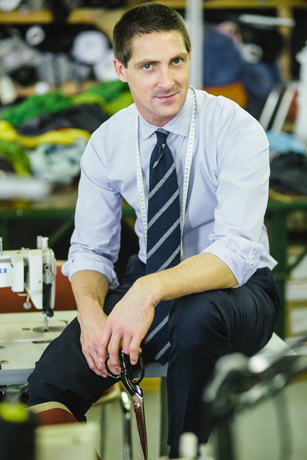 A relationship between a tailor and client is exactly that – a relationship. It evolves over time by working together and constantly striving to improve the product and the process. Despite my grade six capsule collection the real path into the trade took some time as my initial focus and background was in international sport. I was of a rare Canadian breed that chose the other version of hockey – the kind played on a field as opposed to in a rink. The decision served me well as I was fortunate enough to play on the national field hockey team for 15 years and participate in two Olympic Games and a World Cup. Following a degree in political science and with my playing career winding down I found myself being pulled back to the design world. My formal training started at the Ryerson School of Fashion in Toronto and continued in the shops of the tailors who I hassled into providing me with mini-apprenticeships. With their guidance and training I launched the brand with the goal of offering a beautifully fitted, appropriately designed and affordable garment.